Holt McDougal is an American publishing company which developed a program that focuses on textbooks and other likewise materials for secondary schools. It’s a branch of Houghton Mifflin Harcourt. The company publishes textbooks from many fields such as mathematics, science, social studies, language, arts, health, and world language (Spanish, French, and German). Holt McDougal has also provided the Weekly Reader Book Club by publishing children’s books. Below, you will find an easy-to-follow Holt McDougal login guide that takes you through all the steps needed to access your account. You will also find information regarding your registration and possible troubleshooting cases. Before we proceed with the login guidelines, an important thing worth mentioning is the fact that signing up isn’t accessible to everyone. 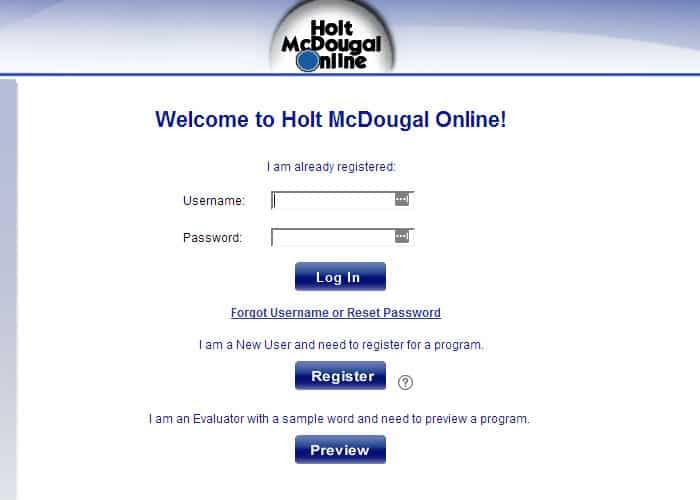 Only people that have registered for a program can gain access to Holt McDougal’s database. Regarding registration, in order to be able to make an account for the online portal to begin with, you will need to purchase an online program first. After that, Holt will provide you with a key code, which you will need to complete the registration form. Once you’ve acquired that key code, head over to the registration page. From the dropdown, select the purpose of your registration. Are you signing up as a student, teacher, or administrator? Next, you’ll continue the registration according to your chosen profile by introducing personal information in the designated fields. On the index page, you will notice the two login fields. Finalize the process by clicking on Log in. Holt McDougal doesn’t have a website specifically optimized for mobile. This means that the login process is the exact same as on a computer. Holt McDougal doesn’t have an official application that you can download and install on your mobile device. On the PlayStore and Microsoft Store, you can find an application titled HMH eTextbooks which claims to provide users access to the textbooks they’ve already purchased. However, it’s highly unstable and many reviews claim that it’s not working. In case you’ve forgotten your password, here are the things you can do to reset it. First of all, talk to your teacher. Students cannot reset their password all by themselves. Your teacher will guide you through the portal and you will eventually land on a password reset page. In the Type your new password field, introduce your new password. Click Save and you will see the homepage once again. Teachers and administrators only need to head over to the password recovery page and type in the email address used for registration. You will receive an email with instructions for password reset.